I recently heard a story about an art teacher who told his students on the first day of class that there were two ways to earn an “A”. One way was to make one perfect pot, the other was to make fifty pots. Now, we’ve all been (or may still be) lazy, know-it-all, shortcut takers and easy-outers. One pot? For an “A”? Psh, sounds like a great plan. How hard can perfect be? One pot– the whole semester for ONE pot?! But the other option… fifty… is the correct one. That’s the choice that teaches you how to make a better pot. A perfect pot. If you make fifty pots over the course of sixteen weeks, your skill will grow and by pot 50, 49, maybe even 48, you might actually create perfection. One pot is a lot of pressure. Fifty pots is like baby steps. I’m adopting this plan for my writing this year. My goal is to stop not getting things out there and just get things out there. They may not be the best, they may be far from perfect, but each step gets me closer to better. I’m going to self-publish a short story electronically. I’m going to do it! How bad can it be? 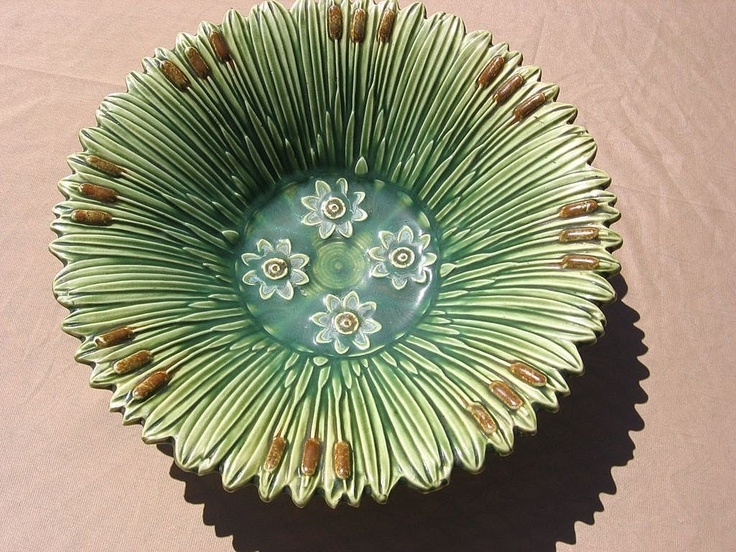 This entry was posted in It's all about me, Writing and tagged 1920's Weller Ardsley Cattails Pottery Bowl, 50 Pots, Fifty Pots, Mary Lamphere. Bookmark the permalink. Great analogy for any task!